It's so simple and so cheap and such a fun date! Funnel cake and a Redbox-I can't think of anything right now better than that combination. The recipe calls for a funnel (duh), but we improvised (like us poor people usually do). We put the batter in a water bottle! Genius. Beat eggs and sugar together and then add the milk slowly--beat. Add the dry ingredients and beat until smooth and creamy. 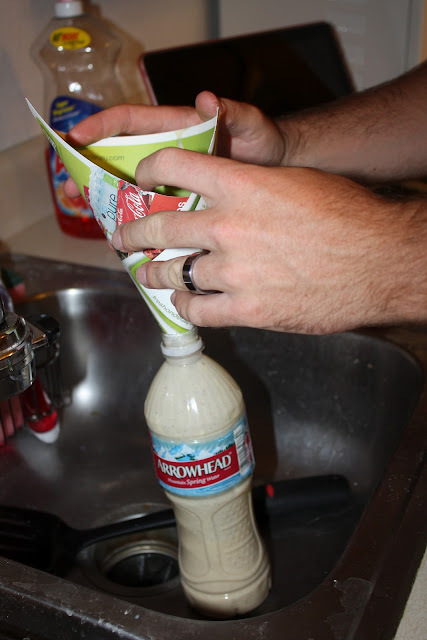 Pour batter into a funnel and at the same time, use your finger to plug the hole. (or put it in water bottle like we did) In a large cast iron pot, add 2 inches of oil to the bottom. When the oil becomes hot, move your hand over the pot and slowly release your finger so the batter can start cooking. Brown on both sides--then immediately remove and drain extremely well. 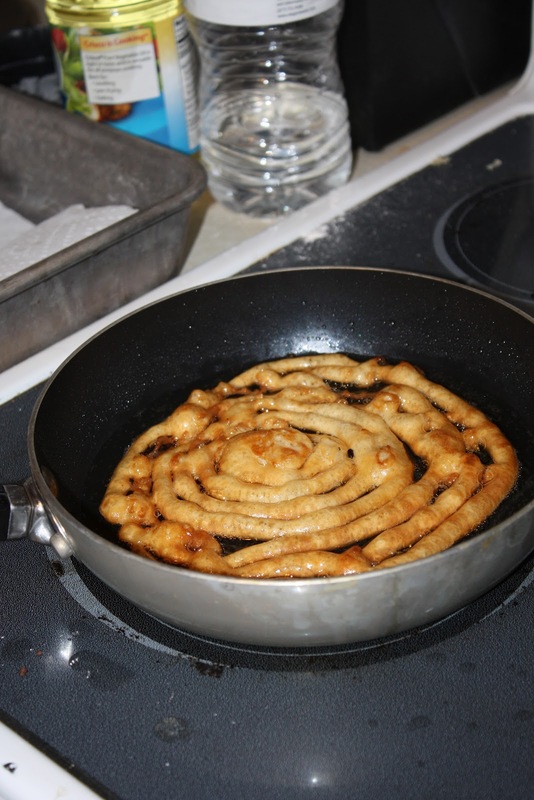 Top with brown sugar, or honey, or cinnamon sugar, or powdered sugar as a topping. Don't mind me looking like a freak in this picture...I was just THAT happy! Happy Weekend! Thanks for you comments on our blog. My husband is actually Dustin's Cousin as well. Wyatt's Mom is a Gibb. We have spoken with Lynsi and she has been such a good support system for us. Anyways, gad to know that you enjoy reading our post! Thanks for the support. You are absolutely hilarious. I think that is a brilliant idea and I might just drive all the way to Idaho to buy ya out:) I miss you so much! YOu are the cutest.